Political Analysis chronicles the exciting developments in the field of political methodology, with contributions to empirical and methodological scholarship outside the diffuse borders of political science. It is published on behalf of The Society for Political Methodology. 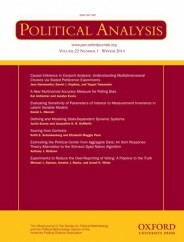 Political Analysis is ranked #5 out of 157 journals in Political Science by 5-year impact factor, according to the 2012 ISI Journal Citation Reports. Like Political Analysis on Facebook and follow @PolAnalysis on Twitter. Improving the transparency of the research published in Political Analysis has been an important priority for Jonathan Katz and I as co-editors of the journal. We spent a great deal of time over the past two years developing and implementing policies and procedures to insure that all studies published in Political Analysis have replication data available through the journal’s Dataverse. At this point in time, we have over 220 studies available in the journal’s Dataverse archive, and those studies have had more than 14,400 downloads. We see this as a major accomplishment for Political Analysis. We are also optimistic that soon many political science journals will join us in implementing similar replication standards. An increasing number of journals developing and implementing replication standards will improve the quality of research in political science, aid in the distribution of materials that can be used in our classrooms, and make the publication process more straightforward for authors. In late September, Jonathan and I had the opportunity to participate in a two-day “Workshop on Data Access and Research Transparency” at the University of Michigan. The workshop is part of an initiative sponsored by the American Political Science Association (APSA) to develop a discipline-wide discussion of how to improve research transparency in political science. The primary goal was to bring the editors of the primary journals in political science into this conversation. While there is no doubt that there was widespread agreement among the journal editors present that making research more transparent and making data more accessible are important goals, there are still open questions about how such goals can be implemented. One of the major products of this workshop was a statement of principles for political science journals. While the statement has not yet been released, it contains a short set of principles, the most important of which are that the signing journals will require authors to make replication materials accessible, and that the signing journals will take steps to make the research published in their journal more transparent. Political Analysis is one of the signatories of this statement: we will continue to work to improve the accessibility of data and other research materials for the papers we publish in Political Analysis, as well as assist other journals as they work to develop their own replication and research transparency standards. Updated and clarified standards for how authors should present empirical results in their submissions, in particular tables and figures. More detailed instructions on our replication requirement. Encouragement and guidance for authors who wish to pre-register their research studies. We hope that other journals will follow our lead, and that they will quickly develop strong standards for replication and research transparency. The APSA initiative is laudable, and it is helping to position political science as a leader in these areas, certainly in the social sciences but also throughout the sciences and humanities. We welcome the APSA DART initiative, and will continue to work to position Political Analysis as a leader in developing and implementing data access and research transparency standards. Headline image credit: Circuit board. CC0 via Pixabay. R. Michael Alvarez is a professor of Political Science at Caltech. His research and teaching focuses on elections, voting behavior, and election technologies. He is editor-in-chief of Political Analysis with Jonathan N. Katz.